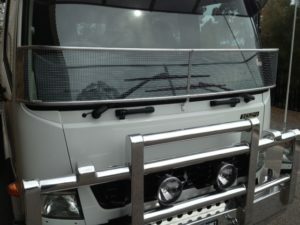 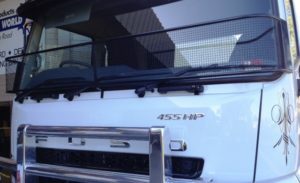 Mitsubishi/Fuso FM Wide Cab 2011on silver mesh stoneguard. 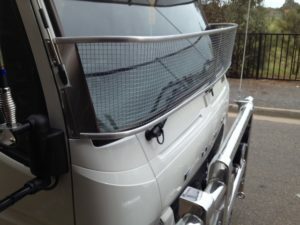 Protection against broken windscreens, and to avoid costly delays, stone guards are relatively cheap insurance. 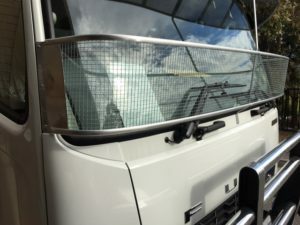 Mitsubishi Canter silver mesh stoneguard, Protection against broken windscreens, and to avoid costly delays, stone guards are relatively cheap insurance.